Around a million people marched on Westminster today demanding a People’s Vote on Brexit. 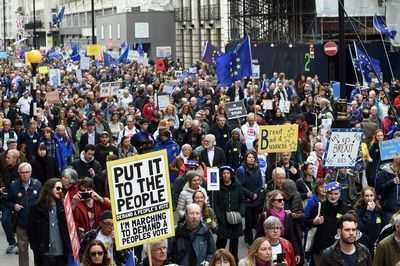 The Put It To The People campaign said the march has overtaken October's protest, which attracted around 700,000. High-density crowds packed the streets as protesters set off from Park Lane ahead of a rally outside Parliament. Crowds have called on the government to give the public the final say on how - and even if - Britain leaves the European Union. This morning a petition calling for Article 50 to be revoked - meaning Britain would remain in the EU - became the most popular ever hosted on the Parliament website. By this afternoon, more than 4.5 million people had signed it. Politicians from across the political spectrum - including Nicola Sturgeon, Tom Watson, and David Lammy - have addressed crowds in Parliament Square as pressure mounts on Theresa May . Speakers told of the 'lies' during the Leave campaign and the lack of control and 'chaos' of the Brexit process, while urging the PM to let people have their say. Meanwhile, a separate march by Brexiteers numbering around 200 was addressed by Nigel Farage this morning. A spokesman from the People's Vote campaign earlier said: “It is almost impossible to put an exact figure on the size of this immense crowd because it is spilling out across central London. The Mayor of London kicked off the speeches criticising ‘party politics’ as delaying a Brexit deal. He said: “I have lived in London all my life. I have never seen London look so magnificent as you do today. “Just days ago we were in danger of falling off the cliff which would have catastrophic consequences. “We have seen party politics repeatedly put ahead of national interest. “We have seen the government ignore our warnings time and time again. He said he was there on behalf of his 10-year-old daughter. “She has told me to thank you for campaigning for her future,” he said. Mr Watson said the Prime Minister’s deal “pleases no-one”. “If you voted remain it’s a rubbish deal, if you voted leave it’s a lousy deal. There are no winners, only losers,” he said. Addressing his comments to Theresa May, he said: “I can only vote for a deal if you let the people vote on it too. First Minister Nicola Sturgeon also took to the stage. She said: “I bring with me today solidarity from Scotland. “A land where 60 per cent voted to remain in the European Union. “Our voice has been ignored. “But it is not merely our voice that has been ignored - but the voice of the 38 percent who voted remain across the UK has been ignored. “My message is for every European national living in the UK, in Scotland and Wales and Northern Ireland. “We think you are welcome here and we want you to stay. Comedian and Great British Bake Off presenter Sandi Toksvig said: “It is women and minorities who will pay the price for Brexit just as we pay the price for austerity. “There’s no denying we did not have the facts. There were lies all over the country. “There are those who would like to drive that bus with all of us on it into the cliffs. Among those taking part in the march are people who voted to leave in 2016, but have since changed their mind. Leon French, 24, who works in the educational sector, said: “I am delighted to attend the Put it to the People March on Saturday so that I can make my voice heard loud and clear to Parliament that the public need a final say on this blindfold Brexit. “I voted to Leave in 2016 and it is now completely clear to me we were given a blank cheque full of false promise. "The easy solution to all our problems we were told Brexit would be has quickly unravelled to be a mess we will be cleaning up for years to come. And Emma Knuckey, 38, from Essex, said: “I’m coming to the march to demand a People’s Vote because I don’t want millions of people paying for my mistake. People of all ages took part and were passionate about the cause. Amelie Upson-Sandland, 10, says she is worried she won’t be able to see her family as she lives in France. Dad Philip added: “I might have to get some kind of long term visa. But it’s more than that, we want to see all of our relatives. We are all over the place.